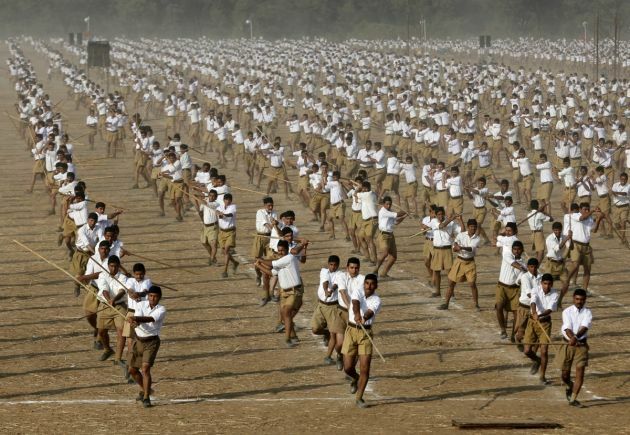 (Photo: REUTERS / Amit Dave)Volunteers of the Hindu nationalist organization Rashtriya Swayamsevak Sangh (RSS) take part in a drill on the last day of their three-day workers' meeting in the western Indian city of Ahmedabad January 4, 2015. A member of parliament from India's ruling party has urged Hindu women to produce at least four children in an effort to "protect" their religion as concerns grow about the stridency of Hindu extremists. The remarks by Sakshi Maharaj, a representative of the northern state Uttar Pradesh, prompted government critics to renew their call for Prime Minister Narendra Modi to temper his hardline supporters. Bharatiya Janata Party lawmaker Maharaj said it was the duty of Hindus to have large families, Agence France-Presse reported. "The time has come when a Hindu woman must produce at least four children in order to protect the Hindu religion," Maharaj told a religious congregation in the city of Meerut. His remarks drew a backlash on social media, as his name became a trending topic on the microblogging site Twitter. The lawmakers has stirred controversy in the past with his provocative statements, The Hindu newspaper reported. Modi's political opponents, meanwhile, pressed the prime minister for an explanation. "Why has the prime minister maintained silence even for 24 hours? Is this the new population policy of India? The country wants to know, the nation wants an answer," said Abhishek Manu Singhvi, a senior leader in the Congress party, which used to rule Indian politics. In his speech, Maharaj declared his support for increasing "reconversions" to Hinduism of Muslims and Christians. This is a thorny issue in parliament which had paralyze legislative sessions with the right-wing BJP government's economic reform agenda being held up. Religious groups and political opponents have accused organizations linked to the BJP of forcing or enticing minorities to convert to Hinduism. Last month, Maharaj issued a controversial comment after he called the assassin of India's hero Mahatma Gandhi a "patriot." Modi, on the other hand, drew heavy criticism in December for refusing to fire another BJP lawmaker who said at a campaign rally that the polls then were simply about Indians wanting a government run by "the children of (Hindu god) Ram or the children of bastards." The remarks were an apparent reference to non-Hindus.